WY Alumnus, David "Bug" Pressel (157lbs.) seated 4th from right. 2018 Ship/Millersville Match... (L-R) Brian Gross, Kyle Narber, Justin Wilkins & Ryan Narber. 2018 Ship/Millersville Match... (L-R) Bob Narber, Kyle Narber, Richelle Narber & Ryan Narber. 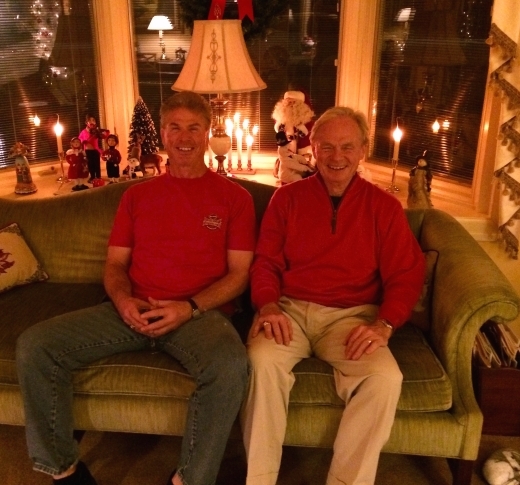 12/25/16 - (L-R) West York's Don Lehman '73 &... Fred Lehman '66. My *ARCHIVES *A 70's ESSC Page!! on the above ESSC/ESU Mat lettermen list! The "BELOW" 1974 photo has "3" NCAA DI Champions! ∙ 3 NCAA DII Champions (Spates, Watts, Luckenbaugh). 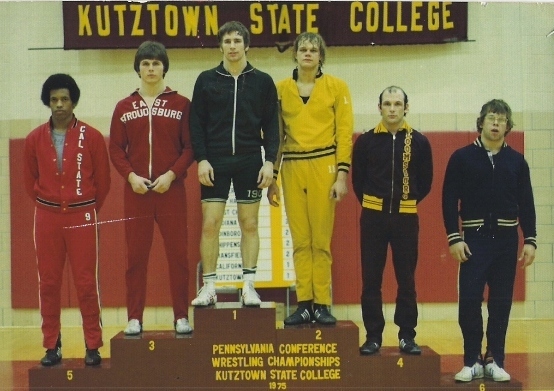 ∙ 1 NAIA Champion (Tom Herr). won the 1974 NCAA Division I title & Outstanding Award! was the 1974 NCAA DII Champion! Randy Watts (Bloomsburg), Don Rohn (Clarion), Bill Luckenbaugh (ESSC). Wade Schalles (Clarion), William Simpson (Clarion), Bob Stetler (ESSC). 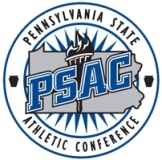 • All of the 1974 PSAC Results/Medalists - click... HERE! 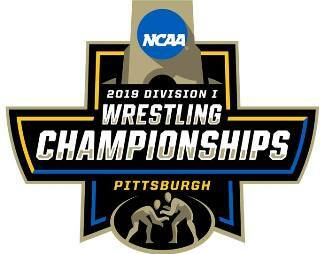 PA Wrestler's Who Became NCAA Champions! *Former West York Coach, Josh Millard (LHU) won a PSAC Crown in '02. "Where you find success, you find sacrifice!" Mike Sitler (trainer), Phil Conlin. From the 1930's to the 2000's! ▪ Front (L-R) Billy Cuff, Keith Lichty, Bill Luckenbaugh, Gary Kessel, Mel Riddick. who had more pins than any wrestler in ESU history. Wilkes' College top wrestler - NCAA DIII Champ Mike Lee. "This is the match you have been waiting for - it's Bill Lucken.....!!" an arm-bar and had his opponent headed for a fall." & Andy Aronstam (West Chester State). @ the 1975 NCAA DI Tourney...to become a 2-time All-American! @ Lock Haven State College! ▪ LHSC's Brian Kuntz - 5th Row - far right. Dave Whare (Millersville), Carlos Bryant (California). Phil Conlin & Dan Leach - '75 ESSC vs. North Carolina State dual meet. just before his untimely passing. Clyde "Red" Witman was a GREAT coach! Standout Wrestler @ Lock Haven University! *Red Lion's/LHU's Brad Lloyd won an EWL crown in '89. from the 1985 YCIAA AAA Sectionals (M. Banks) - HERE! 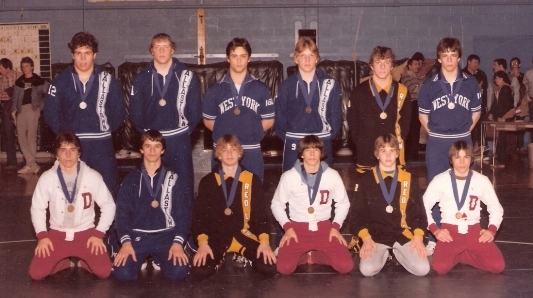 (8th MU wrestler from left in back). 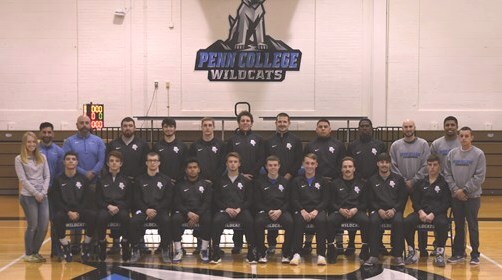 (6th MU wrestler from left in front). Head Coach - Neil Barnes (standing back left). Asst. 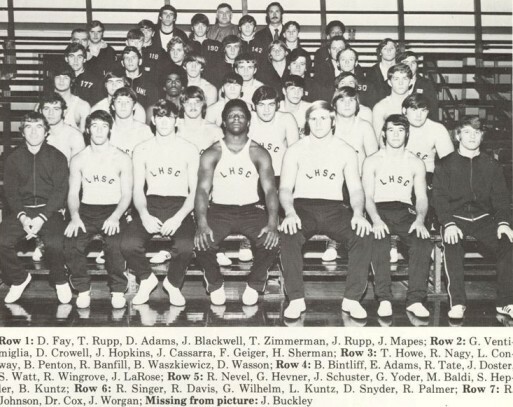 Coach Todd Roberts (standing back right). *Brad Lloyd (Red Lion), Scott Bolton (Dover). Greg Grimm (Red Lion), *Tom Toggas (West York). *Shaun Smith won "3" NCAA DIII titles at... Delaware Valley. on to become a 3-time EIWA champion @ Lehigh University. *Dave Gable... a 3-time EIWA place-winner at F&M College. *Rodger Gay wrestled and lettered... @ East Stroudsburg U.
for the Lock Haven University Eagles @ 167lbs. & 177lbs. 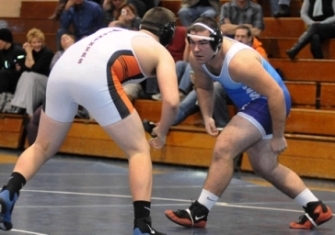 ∙ Brad Lloyd is featured on practically all Lock Haven University Wrestling Records. 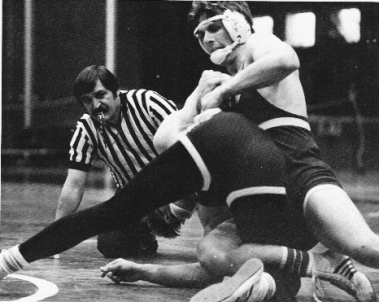 ∙ Brad Lloyd had a career record of 146-25-2 at LHU with 44 falls and 28 tech. falls. 3-time NCAA DIII Champion at Delaware Valley College! (Shaun Smith - 88-1 career @ Delaware Valley College). * Bill Luckenbaugh (West York/ESSC - was a 1974 NCAA DII National Champ). Banks (York Suburban/Vo-Tech) a close second!" ∙ 1988-89 (L-R) LHU's Craig Corbin & Brad Lloyd. NCAA DI 2nd place finish in '89, Brad also placed 3rd in '88 & 7th in '86. at the NCAA's - in '90 & '91... earning consecutive DI All-American honors. ▪ Brad Lloyd in some Red Lion YCIAA Sectional Photos... 1981, 1982, 1983. Also - a PDF LHU article on Brad Lloyd from 1989 - HERE! ▪ Lock Haven University Wrestling Records - HERE! 1967 - YJC's Fred Lehman takes 177lb. title. *Jeff Linebaugh, & Bob Terrill. *Fred Lehman, John Schlaffer, Andy Hanzlik & Mgr. Lonnie Rutledge. Howard Zachmann, Len Swanson, Dean Sisemore, & Randy Umberger. Jeff Linebaugh (1967) & Fred Lehman (1966). **Gobel Kline ▪ 1969 NCAA Division I Wrestling Champion CLICK HERE! wrestled for East Stroudsburg State & Coach Clyde "Red" Witman...? √ Answer... ESSC's Chet Dalgewicz, Fred Swanson & Don Lehman! 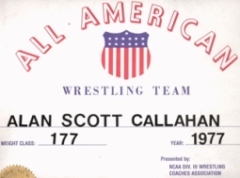 certificate submitted by Ursinus Head Wrestling Coach - Bill Racich. vs. West Chester State in Koehler Fieldhouse ('77). by NCAA Mat Division Page! FROM THE WEBMASTER - DON LEHMAN.